Do your cables look like this? These cables were prepared by a DIRECTV-certified technician. As you can see the input cables are gently looped around, rather than making a sharp bend. This is the proper way to run cables that require a change in direction… as gently as possible. Never make a tight 90 degree turn with a coaxial cable. You may think that because the cable is robust and thick, it can take a turn like this. Nothing could be further from the truth. A coaxial cable is a very delicate precision part of your TV distribution system, often with several layers of shielding that must function perfectly to make sure that you get the best performance from a long run. 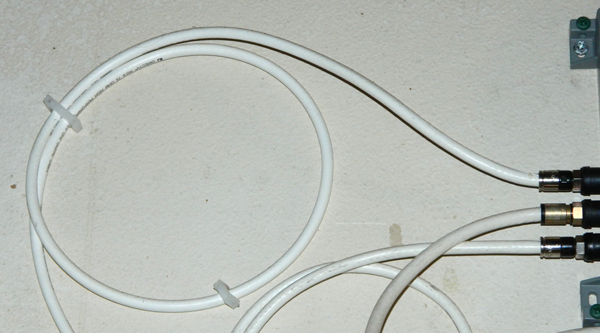 Sharp bends can break the fine wires within cables or allow outside RF interference inside. Not only that, electricity is not that different from water. Imagine water flowing through a or down a street. If a sharp, 90 degree turn is made, the water will splash up and won’t flow smoothly. The same phenomenon is true of electricity, in a way; it doesn’t really “like” sharp angles. It likes to flow smoothly. Sharp turns can disrupt the flow and when you’re counting on a few microvolts to carry hundreds of channels of TV, you don’t want a disrupted flow, right? Of course, it’s impossible to imagine that you can run straight lines without any bends. If you need to run a cable around a corner or at an angle, use the gentlest possible pressure to let the cable “tell you” how much of a bend it can take. Cable comes on a spool so it can take a 12″ radius bend with no problem. By positioning the cable so it does not bounce back or strain against any clamps, you’re guaranteeing the best possible signal performance. Before putting a cable in place, if you’re not pulling it right from the spool, look at the jacket and see if there are any stretch marks or strain marks. This may indicate that the cable was bent at some time in the past. Making sure that there is no stress or strain on your cables when you’re installing will save you a lot of headaches later.